The aim of the conference is to bring together researchers and experts from Academia and Industry to discuss the challenges and deliberate upon solutions related to the myriad facets of the transformation taking place in the emerging markets. Inaugurating the conference, Sir (Dr.) Huzaifa Khorakiwala, Founder, Wockhardt Foundation shared the journey of starting his foundation to serve humanity through various programmes in health, education, water and sanitation across the country. He shared the vision of Wockhart Foundation to have 1000 mobile medical vans equipped with doctor, pharmacist, medicine and diagnostic in next 5 years which would be administered to free primary healthcare in villages. He further briefed about ‘The World Peacekeepers Movement’ which is based on 7 human values including Love, Truth, Giving, Gratitude, Forgiveness, Humility and Patience and averred that inner peace and success in any profession can be attained by practicing human values. Addressing the gathering, Mr. Surya AV, CEO – South Asia, Kantar Public highlighted about the analysis of a survey wherein website content of 25 FMCG companies and published interviews of their CEOs’ were monitored. He apprised that it was observed that the companies which had used positive words such as cutting edge, transformation and leadership in their website content and even in interviews, those were performing 2.2 times better than others. He emphasized that in the present times, income divide is increasing and skill gap is a major concern. Most of the companies are adjusting with the current supply of human resource. He stressed that it is a collaborative responsibility of corporates, educational institutions and Government to resolve the challenges. Mr. Surya advised the budding professionals to think change to lead the change and conduce to inclusive environment. Speaking on the occasion, Mr. Bhaskar Ranjan Das, Head of South Asia, CIMA said that research is about solving issues and discovering new opportunities. Mr. Das urged the students to have different approach towards research and advised that research shouldn’t be limited to academic periphery but must be applied in every field to improve lives. Dr. Jibitesh Rath, GM-HRD, National Mineral Development Corporation (NMDC) stressed that there is a huge gap between industry and academia in regard to manufacturing industry. The human resource are not trained and skilled as per industry needs. He apprised that Indian economy is growing rapidly but unemployment rate is still high, leading to a jobless growth of the Nation. 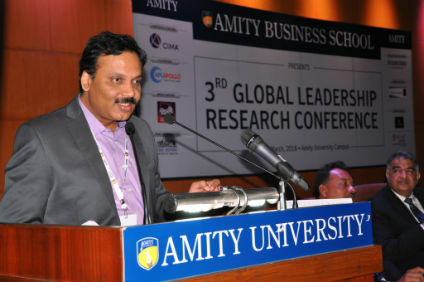 Mr. Atul Bhola, Sr. Vice President, SAIJ highlighted that research is a paragon for successful leadership and required to acquire the change of scenario in business, society, environment and various other aspects to attain sustainability. Sharing her views, Dr. (Prof.) Balvinder Shukla, Vice Chancellor- Amity University Uttar Pradesh said that the rise of emerging markets has shifted the emphasis from growth to a combination of growth, profitability and competitiveness. She stressed that development of a company is now based on the understanding of customers’ needs and improving the quality of product and service accordingly. Dr. Shukla called upon the budding professionals to interact with the speakers as such conferences abreast them with business reality and foster necessary skills & knowledge required for a successful professional journey. During the occasion, Amity Leadership Awards were conferred upon eminent personalities to recognize their contributions in the sector including Sir (Dr.) Huzaifa Khorakiwala, Founder, Wockhardt Foundation, Ms. Meenakshi Davar, Director-HR, Power System Operation Corporation Limited, Mr. Sateesh Myneni, Co-Founder & COO, CISO Cyber Security Pvt. Ltd, Ms. Shefali Munjal, Executive Director, Hero Corporate Service Private Limited, Dr. Elda Du Toit, CGMA, Associate Professor, University of Pretoria, Mr. O. C. Karnaney, Ex. Director & Business Head – Ceiling, Armstrong World Industries (India) Pvt. Ltd. and Mr. Asit Shekhar, Sr. Vice President (State CEO – Delhi NCR), Reliance Jio Infocomm Ltd. The two day conference will witness a conglomeration of around 100 distinguished speakers from corporates and academia deliberating on the theme during 12 technical sessions. More than 150 research work will be presented during the conference.